With more and more children participating in organized sports, the number of sports-related injuries is rising. Since children's bodies are growing and developing, they are more prone to injury than adults and more likely to suffer permanent damage if these injuries are not handled properly. Micheli, former president of the American College of Sports Medicine, points out that proper coaching techniques are crucial to prevent such injuries. He advises parents on how to find a good coach and to be sure that children are neither over- nor undertrained. Part 1 investigates every aspect of youth sports: why children join; nutrition; stress, both physical and mental; the effects and restrictions imposed by chronic illness or disabilities; drug use; and special concerns for female athletes, including amenorrhea and bone density. Part 2 examines each area of the body and discusses the particular acute and repetitive-use injuries to which they are subject. Also covered are congenital defects that may be revealed and/or exacerbated by certain types of activity, as well as first aid and extended care tips for every injury. 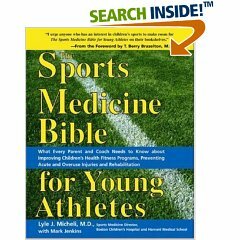 Parents of sports-minded youngsters will want this well-organized and clearly presented book.